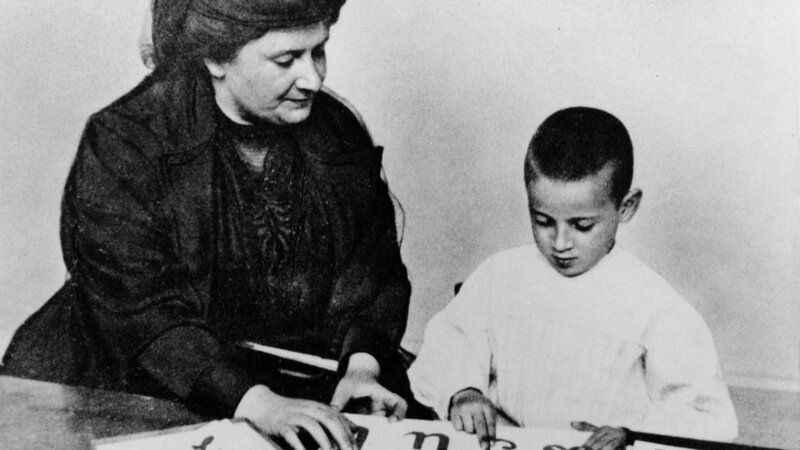 Maria Montessori was born in Ancona, Italy,in 1870. When she was 12, her parents moved to Rome and encouraged her to become a teacher, the only career open to women at the time. She was first interested in mathematics, and decided on engineering, but eventually became interested in biology and finally determined to enter medical school. In 1896 she became the first woman to graduate from the University of Rome Medical School and joined the staff of the University's Psychiatric Clinic. As part of her duties, she visited children committed to the insane asylums. She became convinced these mentally deficient children could profit from special education and studied the work of pioneers Jean Itard and Edouard Seguin. Montessori was named director of the State Orthophrentic School in 1889. She worked with the children there for two years. All day she taught in the school and then worked preparing new materials, making notes and observations and reflecting on her work. These two years she regarded as her "true degree" in education. To her amazement, she found these children could learn many things that had seemed impossible. This conviction led Montessori to devote her energies to the field of education for the remainder of her life. Dr. Montessori returned to the University of Rome to study philosophy, psychology, and anthropology. She also served on the staff of the Women's Training College in Rome (one of the two women's colleges in Italy at that time), practiced in the clinics and hospitals in Rome and carried on a private practice of her own. In 1907 she was asked to direct a day-care center in a housing project in the slum section of San Lorenzo, Italy. Montessori accepted, seeing this as her opportunity to begin her work with normal children. She was to have the care of sixty children between the ages of 3 - 7 while their illiterate parents were working. The sparse furniture was similar to that used in an office or home, and the only education equipment was the pieces of sensorial apparatus Montessori had used with her mentally defective children. Montessori says she had no special system of instruction she wished to test at this point. She wanted to compare the reactions of normal children to her special equipment with those of her mental defectives. She attempted to set up as natural an environment as possible for the children, and then relied on her own observations of what occurred. After instructing the teacher in the use of the sensorial apparatus, she remained in the background, and waited for the children to reveal themselves to her. There was one startling development of direct academic significance. Montessori had not intended to expose children so small to any activity bearing on writing and reading: the mothers began to beg her to do so. She finally gave the four-and-five-year old some sandpaper letters to manipulate, and trace over with their fingers. Some children eventually began to connect sounds with the letters, and to try to sound out and put together words. Soon they had taught themselves to write. They would read the words they had written, but were uninterested in those anyone else had written. They then began to read with the same enthusiasm that they had written, reading every extraneous item in their environment - street signs in shops, etc. They showed little interest in books, however, until one day a child showed the other children a torn page from a book. He announced there was a "story" on it, and read it to the others. It was then that they seemed to understand the meaning of books. They began reading them with the explosion of energy they had previously exhibited in writing and reading words encountered at random in their environment. The process was interesting on three counts: one, spontaneity and direction of this activity from the beginning belonged to the children; two, the usual process of reading preceding writing was reversed; three, the children involved were only four and five years old. In observing all these developments in the children, Montessori felt she had identified significant and hitherto unknown facts about children's behavior. She also knew that, in order to consider these developments as representing universal truths, she must study them under different conditions and be able to reproduce them. In this spirit that same year, a second school was opened in San Lorenzo, a third in Milan, and a fourth in Rome in 1908, the latter for children of well-to-do parents. By 1909, all of Italian Switzerland began using Montessori's methods in their orphan asylums and children's houses. Word of Montessori's work spread rapidly. Visitors from all over the world arrived at the Montessori schools to verify with their own eyes the reports of these "remarkable children." Montessori began a life of world travel - establishing schools and teacher training centers, lecturing, and writing. The first comprehensive account of her work, The Montessori Method, was published in 1909. 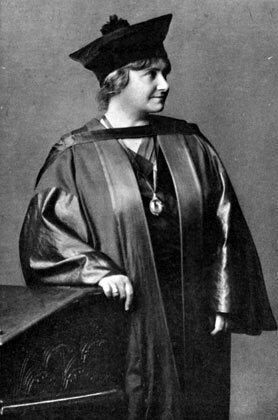 Montessori made her first visit to the United States for a brief lecture tour in 1912. An American Montessori association was formed with Mrs. Alexander Graham Bell as President, and Miss Margaret Wilson, President Woodrow Wilson's daughter, as Secretary. So pleased was Montessori with her reception here she returned in 1915, this time to give a training course in California. 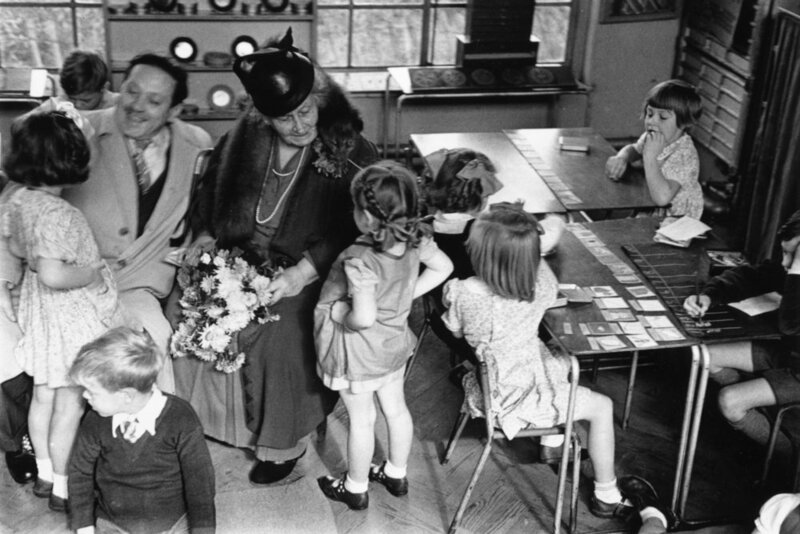 During this visit a Montessori class was set up at the San Francisco World's Fair and received much attention. During the years 1916-1918, Montessori herself traveled between Spain, where she was directing the Seminari Laboratori de Pedagogia at Barcelona, and the United States. Except for the temporary closing of Montessori schools in countries taken over by the Nazi and Fascist regimes, Montessori continued to flourish in other parts of the world without interruption. Much of the work today is directed by the Association Montessori Internationale with headquarters in Amsterdam. 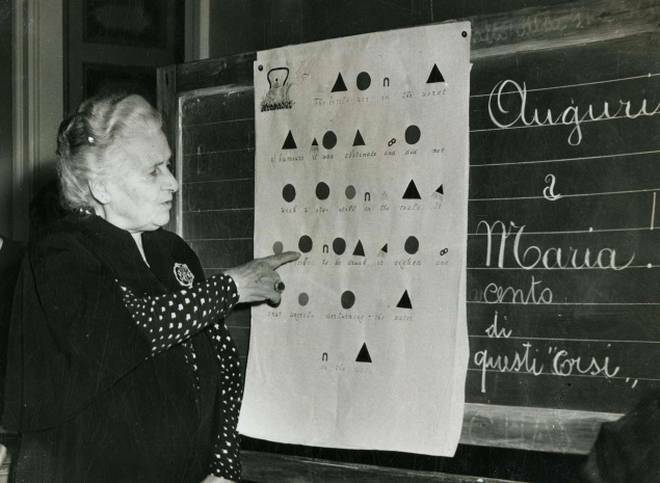 Montessori was appointed Government Inspector of Schools in Italy in 1922. However, she was increasingly exploited by the Fascist regime, and by 1931 she had begun to work chiefly out of Barcelona, and she established permanent residence in the Netherlands. Her work was interrupted in 1939 when she went to India to give a six-month training course, and was interned there as an Italian national for the duration of World War II. She established many schools, however, in India, and today it is an active Montessori center. Montessori died in the Netherlands in 1952 receiving in her later years honorary degrees and tributes for her work throughout the world.